On 11th September 1851 the first missionaries of the Church of Jesus Christ of Latter-day Saints arrived in Norway. Within just twelve days they had baptised Svend Larsen of Østerrisör as the first Norwegian convert. The early Mormon missionaries experienced enormous difficulties as they travelled throughout Denmark, Norway and Sweden spreading the word of the gospel and the book of Mormon. They encountered widespread opposition to their missionary work and were regularly fined or imprisoned in an attempt to stop the growth of the church. Despite the difficulties they endured, they slowly succeeded in gathering small numbers of converts to their church. Though they could not meet for regular worship in public places, they were often able to meet in small groups in houses throughout Norway. On the 14th August 1852 the Brevig [later Christiania] Conference was organised at a general conference of the Scandinavian Mission held in Copenhagen. The Christiania Conference included the whole of Norway and involved Church Elders and missionaries travelling extensively throughout Norway to spread the gospel of the Church of Jesus Christ of Latter Day Saints. As it was difficult for members of the church to meet or practice their religion freely in Norway and Sweden, the church encouraged converts to migrate to Utah - or Zion as it was commonly referred to. In Utah they would be free to practise their religion and the first Norwegian convert left Copenhagen on 22nd December 1853. The 'gathering to Zion' was organised through the Scandinavian Mission of the Church of Latter-day Saints in Copenhagen. Norwegian emigrants started their journey by travelling to Christiania and from there sailing on steamship to Copenhagen. From Copenhagen the emigrants then sailed to Kiel, travelled from Kiel to Hamburg by train, before crossing the North Sea to Hull or Grimsby by steamship. 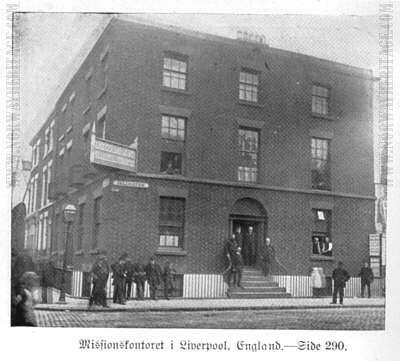 From Hull or Grimsby they travelled by train to Liverpool - where the European headquarters of the church's European Mission was based. The mission house in Liverpool. Picture from the book "Jorden Rundt, en Reisebeskrivelse", by Anderw Jenson, printed in Salt Lake City, Utah in 1908. Written in Norwegian. In Liverpool the Saints would be joined by other British Mormon converts who were also emigrating to Utah. Often joined by non-Mormon emigrants, the saints would then journey across the North Atlantic to New York via the passenger services of the Guion Line of Liverpool. Liverpool and Great Western Steamship Company - Guion Line. Officially named the Liverpool and Great Western Steamship Company but the line soon became known as the Guion Line. 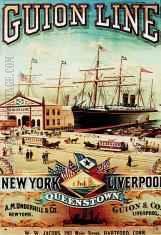 It was founded in 1866 for the Liverpool to New York, via Queenstown, route. Their fast ships were making the voyage in 6 days, 21 hours, 40 minutes in 1883. The Oregon reduced that to 6 days, 10 hours, 10 minutes that same year. The line ceased operations in 1894. The journey to Liverpool was a complicated experience for the Norwegian emigrants as they had to "gather" with other Mormon converts in Christiania, Copenhagen, Hull and Liverpool. By gathering together all of the Scandinavian speaking Saints, the Church was able to ensure that Elders would travel with the emigrants for the whole of their journey to Utah. No other group of emigrants was provided with comprehensive help by people who could converse in both English and their native language. Despite such assistance, the Mormons often had to endure the effects of protest and mob violence by non-Mormons as they gathered to depart from the quayside in Norway or Copenhagen. The experiences of Norwegian Mormons migrating to Utah were described in 1927 by Andrew Jenson in his book 'History of the Scandinavian Mission'. For the journey of a group of Norwegian Mormons emigrating from Christiania in 1863 he provides the following narrative. About two hundred emigrating Saints from the Christiania, Lolland and Bornholm conferences sailed from Copenhagen per steamer Aurora, April 30, 1863, bound for Utah, under the leadership of Elders Carl C.N. Dorius, Johan F.F. Dorius and Hans Peter Lund. Some of the Norwegian emigrating company (28 souls) had sailed from Christiania [on] April 13, 1863, per steamer Excellensen Toll. A strong and contrary wind on the Skagerak and Cattegat made the voyage very uncomfortable, but the emigrants were safely landed in Copenhagen [on] April 15th. Another company of emigrating Saints (about one hundred souls) left Christiania, Norway, [on] April 28th, under the direction of Elder Johan F.F. Dorius and arrived in Copenhagen, [on] April 29th, where the Norwegians joined the emigrants from other parts of the mission. About a dozen Saints emigrating to Zion went direct from Stavanger to Hull where they joined those who had sailed from Copenhagen. When the emigrating Saints left Copenhagen [on] April 30th the weather was fine, and a great number of people congregated on the wharf to see the Saints leave, but there were no disturbances, as a number of police had been detailed on special duty to keep order. The emigrants made themselves as comfortable as they could on the deck and in the second cabin of the Aurora, which on the morning of Friday, May 1st, arrived at Kiel, where the emigrants walked to the railway station and left at 11 o'clock a.m. by railroad for Altona, where they arrived at 3 o'clock in the afternoon. From Altona to Hamburg the emigrants walked in about half an hour to the ship Roland, on which they went on board, together with about four hundred emigrating Saints from Jutland and Fyen (or the Saints from the Vendsyssel, Aalborg, Aarhus and Frederica, and like those who commenced the voyage from Copenhagen, landed in Kiel, whence they travelled by rail to Altona. After the emigrants, numbering nearly six hundred souls, had gone on board, together with about forty steers and several hundred sheep (which made the atmosphere on board anything but comfortable for the emigrants), the ship Roland sailed from Hamburg May 1st about midnight. The weather was very fine, but the emigrants, in their crowded quarters, nevertheless, were uncomfortable. Early on Sunday morning, May 3rd, the Roland cast anchor off Grimsby, and a little later sailed to the wharf, where most of the emigrants landed, with some of their baggage; the balance of the baggage, together with forty of the brethren, remained on board, as the ship went to Hull, where they arrived at 6 o'clock in the evening and remained on board all night. The next morning (May 4th) a small steamer ran up to the side of the Roland and took the rest of the baggage, belonging to the emigrants, back to Grimsby, while the forty brethren went to the same place by rail. Elder Carl C.N. Dorius, however, remained in Hull where he, about 11 o'clock the same day, received some emigrants (seven adults and six children) who arrived direct from Stavanger, Norway, per steamer Skandinavien. In the afternoon, after settling with the captain of the steamer for their passage, Brother Dorius led these emigrants by steamer and train to Grimsby, where they were united with the other emigrants. At Grimsby the emigrating Saints were made quite comfortable in a large building erected for the use of emigrants. On the 6th all the emigrants, except the Norwegians, made themselves ready for the journey to Liverpool. They left, nearly seven hundred strong, by rail for that city at 5 o'clock in the afternoon. A young Danish sister who was sick was carried in a chair to the cars. The exact number of emigrants who arrived in Liverpool [on] May 6th, 1863, was 681. At this port 644 Scandinavian and 13 English Saints were taken on board the ship B. S. Kimball [captained by H. Dearborn], while thirty-seven Scandinavians were placed on board the ship Consignment. Elders Anders Christensen was placed in charge of this little band. (Extract taken from Pages 175-179, Andrew Jenson, History of the Scandinavian Mission, (Utah, 1927). The local press in Norway also described the leaving of the emigrants on board the Excellence Toll. The Scandinavian newspapers and the Lutheran Church used their ability to communicate with the local communities - through the press and their church services - to stir up opposition to Mormonism in Norway. Regardless of whether the preacher had been found guilty of theft - which was highly unlikely as the Mormons were often commended for the fact that they were so law abiding - the distress caused to the Latter-day Saints was enormous. Such actions occurred throughout the early history of the Mormon church in Scandinavia. After 1884 the Norwegian Mormon emigrants increasingly travelled to Hull direct from Christiania, on board the steamships of the Wilson Line of Hull. 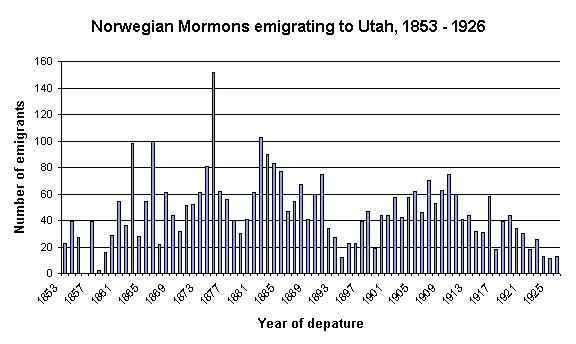 Overall between 1853 and 1926 the Scandinavian Mission of the Jesus Christ of Latter-day Saints assisted over 3 437 Norwegians to emigrate to the United States. Many often came back from Utah to serve on Missions to their country of birth - using their linguistic skills and experiences in Utah to spread their beliefs and the work of the church. The following table will hopefully illustrate in more detail the numbers of Norwegians who departed each year. A microfilm of some of the voyages from Copenhagen to Hull (between 1872 and 1894) can be ordered via any Latter-day Saints Family History Library using the reference FHL 0040994. Alternatively a CD-Rom by Professor Fred Woods with details of hundreds of voyages and first-hand accounts by the emigrants can be ordered through the web site of the Jesus Christ of Latter-day Saints. Should you have nay queries regarding Mormon emigration from Norway please do not hesitate to contact Nick Evans. © Copyright of Nicholas J. Evans 2001. Not to be reproduced in any form without the prior permission of the author. This article was written by Dr Nicholas J. Evans who has lived in Hull for most of his life. Nicholas J. Evans is a Lecturer in Slavery Studies at the Wilberforce Institute for the study of Slavery and Emancipation (WISE) at the University of Hull. He is currently engaged in a project that examines aspects of voluntary and coerced Jewish emigration to South Africa between 1890 and 1960. He gained his BA (Hons) Degree at the University of Leicester and has currently finished his Ph.D. (based at the Maritime Historical Studies Centre, University of Hull) that examined the neglected subject of European transmigration through Britain between 1836 and 1914. He is the former Caird Fellow of the National Maritime Museum, London, Kaarle Hjalmar Lehtisen Researcher of the Institute of Migration, Finland, and Research Assistant at the Research Institute of Irish and Scottish Studies, University of Aberdeen, UK. Any information on emigrants who travelled via Hull or any of the UK ports of arrival would be very welcome. If you have such information please contact Nick Evans or the web master.